Foot racing and boxing are two of the world’s most ancient and primal forms of athletic competition. Over the last 24 hours we have witnessed two great sporting contests, one in each of those sports, both pitting titans of their respective disciplines against one another. But only one registered outside its own arena and industry. Last night boxer Floyd “Money” Mayweather lived up to that moniker as he took home a guaranteed $41.5 million — with the potential payoff of $100m – winning a majority 12-round decision over 23 year-old Mexican superstar Saul Canello Alvarez at the MGM Grand Hotel in Las Vegas. Though one judge inexplicably saw the bout as a draw, the other two judges — and the viewing public — saw a clear win for the 36 year-old Mayweather. The fight was the pinnacle of a lavish three –month long build-up that developed the bout into one of, if not THE, richest fights in history. 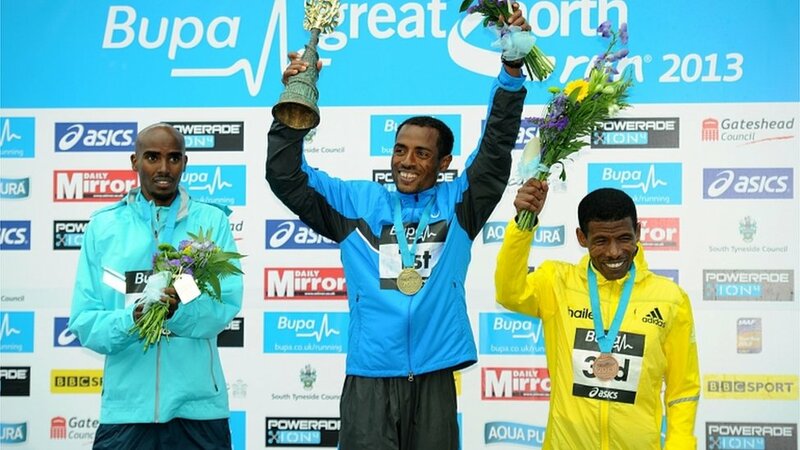 2013 Great North podium,, (l-r) Mo Farah, Kenenise Bekele, Haile G.
The foot race, the Bupa Great North Run, was staged in Newcastle, England where veteran Ethiopian track and cross country superstar Kenenise Bekele halted England’s favorite son Mo Farah from wresting the title ‘undisputed greatest runner in the world’ by holding off the reigning double Olympic and World Champion over the final 800 meters of the half-marathon distance. For spice, the man renown as the Greatest Runner of All Time, 40 year-old master Haile Gebrselassie of Ethiopia more than held his head high, finishing a respectable third after leading the contest for much of the way while establishing a new master’s world best for the distance (60:41). 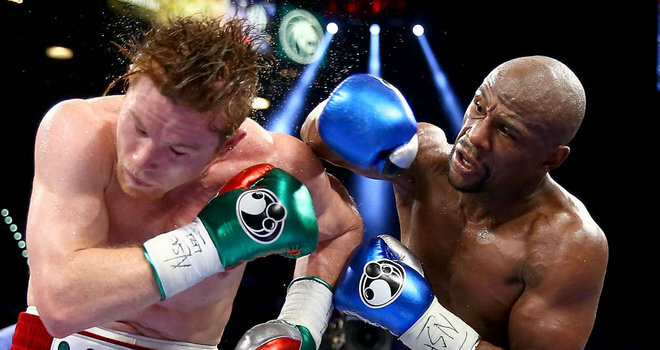 But while Mayweather vs Alvarez was watched by millions on pay-per-view TV at $65 (standard definition) and $75 (high def), the contest between three of the world’s greatest runners was seen on BBC domestically in England, but was unavailable for viewing in the USA other than through a hacker website. This all comes on the heels of San Diego-based Competitor Group’s recent decision to dismantle its elite racing program for its U.S. Rock `n` Roll events, effective immediately. The first casualty of that decision could be found in Philadelphia, where today the once mighty Philadelphia Distance Run, one of the world’s most storied half-marathons (in recent years re-branded as one of CGI’s 38 Rock `n` Roll events) saw a still fine, but diminished elite field vie for a $3500 first place prize. The original slate of athletes recruited by now-departed CGI coordinator Matt Turnbull included two-time women’s World Marathon champion Edna Kiplagat, two-time Boston Marathon queen Rita Jeptoo, 2011 Boston and New York City Marathon course record holder Geoffrey Mutai, half-marathon world record holder Zersenay Tadesse of Eritrea along with American stars Meb Keflezighi and Dathan Ritzenhein, all of whom did not compete after their previously agreed upon appearance fees were eliminated just two and a half weeks out from the race. Defending Philly champion Stanley Biwott of Kenya still came and won, despite the loss of the appearance fee, as he had planned to use the event as his tune-up for the November 3rd ING New York City Marathon. But as the sport of distance running moves forward in the wake of the CGI pull-out from elite competition, it must answer some difficult questions. Can running ever be turned into anything approaching a spectator sport? Or is it fated to be nothing more than a niche sport with a massive participation base for all time? Then we have the women’s contest at Great North. The entire build up was the rivalry match-up between Ethiopian Olympic champions Dibaba and Defar. Yet upon waking and searching the internet, we find that Kenya’s Olympic Marathon silver medalist Priscah Jeptoo, truly one of the world’s great distance runners, had destroyed both Ethiopians on the way to victory. Nothing against Jeptoo, a great athlete, but the art of promotion is to draw attention to a specific battle, to focus the attention of the sporting public, not to conduct a free-for-all. It would be like putting another fighter in the ring with Mayweather and Alvarez who then knocked both of them out, even though he wasn’t part of the pre-fight build up. The whole rivalry between Dibaba and Defar is a boiling pot of intrigue, because they both hail from Ethiopia, are considered the preeminent female distance runners of their generation, yet don’t get along, and have raced so infrequently against one another over the years — this would only be their fourth meeting in four years coming off Defar’s recent win at 5000 meters at the Diamond League meeting in Zurich – that to include the unheralded Jeptoo ended up stepping on the whole rivalry promotion. Purists might say, that’s sport, best person wins. Fine. Then build up Jeptoo with the two Ethiopians like Haile, Kenny, and Mo were for the men’s race. But running has always suffered with promotion. Coming from its decades-long amateur background, running has never gone fully pro. Without being overly judgemental, in western sporting culture money validates; the greater the stakes, the more interest in the outcome. Last weekend Serena Williams and Rafa Nadal earned $2.6 million for their U.S. Open tennis wins in New York, with an additional $1 million in bonus money for winning the Emirates Airline U.S. Open Series. Next week the 30 top pro golfers will decide the chase for the Fedex Cup In Atlanta with the champion walking home with $10 million. Another important factor is the discrepancy between shoe company contracts and event organizer prize purses in regard to athlete compensation. A generation ago, athletes didn’t get paid unless they raced, while sponsor income was negligible. In current times, however, sponsor income massively dwarfs organizer income for the sport’s top athletes. Shoe contracts for the very top runners, for instance, outpace what a company like Competitor Group spent on its entire elite athlete budget, which has been reported at just under $1 million. But while every major league baseball, football (both U.S. football and world football), and basketball contract is revealed in all its lurid extravagance, I have never heard of a single runner’s contract ever being publicly touted. Prize purse earnings end up being the pocket change portion of an athlete’s income, except for the big-city marathons with their six-figure appearance fees. And those numbers only go to the very top athletes. Yet the only time the World Marathon Majors two-year cycle format worked to perfection was at the 2010 BofA Chicago Marathon where the sadly departed Sammy Wanjiru of Kenya out-kicked Ethiopia rival Tsegaye Kebede in a race for the ages for the $500,000 WMM circuit bonus. It was the half-million dollar payoff which riveted public attention. They were racing for something of perceived value to the general public. This is why the U.S. road circuit is littered with second and third tier Kenyan and Ethiopian athletes scrounging for a few thousand dollars here, another few thousand there. They don’t get shoe contracts, so they have to race and race and race to make a living, just like the racers of old, when someone like Bill Rodgers, who got $1000 for his first New York City Marathon appearance in 1976, raced 35 times in 1981, because racing was where the money was at that time, although then, too, hidden in appearance fees. Thus, as the sport moves forward in the post-Competitor Group era, it must once and for all decide whether it intends to be a professional sport that comports itself as such. To do so means joining forces so that the power of its numbers in the aggregate can be scaled for public consumption and market sales. Individual principalities, what I call Germany pre-Bismarck, simply will not be enough to elevate the sport beyond its current, massive participation identity. That means the Boston Athletic Association Half Marathon, the final leg of their internal three-race 2013 B.A.A. Distance Medley, cannot be scheduled on the same day as the Bank of America Chicago Marathon, which just happens to be one of their World Marathon Majors partners. 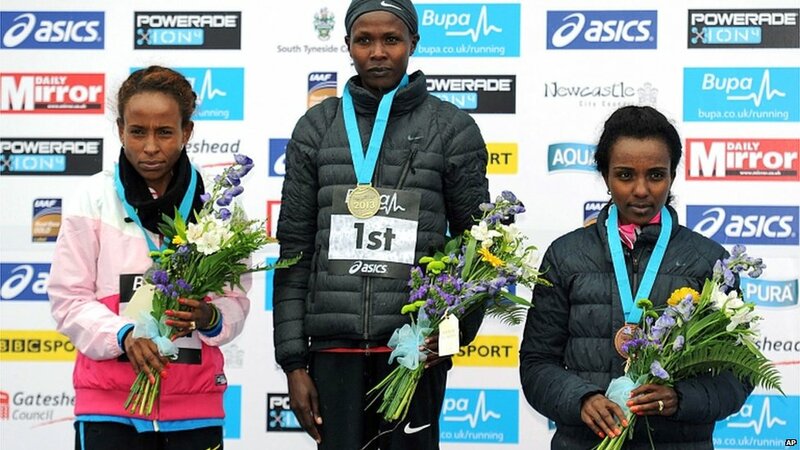 It means Priscah Jeptoo is either touted alongside Defar and Dibaba at Great North, or she isn’t invited at all, irrespective of here standing as the world’s first or second best current female marathoner. Come on, running! 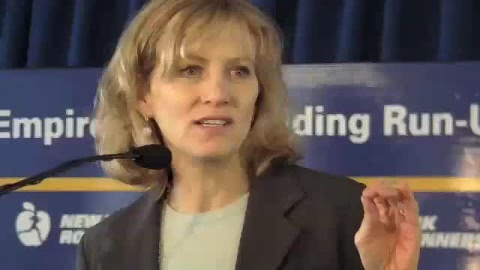 Let’s not prove Competitor was right. Great piece. I wonder if the general US public would ever watch a sport they also participate in. 1 question: How much money did this elite road race fundraise for a worthy cause? And, it only cost the race management $200 K for those three super stars to show up? Sounds pretty good ….